Immediately you’ll realise there’s a problem with playing darts with a PlayStation Move controller. Compared to a dart it’s like throwing a wacky TV remote, it’s just way too big. Despite this and the hand-cramp it causes during longer sessions, there’s actually a decent darts game here that is fun to play once you get used to it. Aiming is slightly awkward as you have to point the shaky cross-hairs at the target on the screen. Bear in mind that not all the board is displayed at once, so you have to drag the cursor around until the appropriate area moves into view. On the plus side, this close viewpoint gives you a lot of board to aim at for the essential doubles and triples. There are other viewpoints available which show more of the board at once, but they feel harder to aim with. Once you have your target you can hold down the Move button or the trigger (the controller can be held regularly or upside-down) and prepare to throw. After selecting your target you only need to focus on ‘throwing’ the dart/controller straight towards the PS Eye rather than the area you were aiming at previously. You release the button/trigger when you feel you have put enough strength into it. An on-screen metre gauges how hard you’re throwing and it does will take a while to get used to it. Once you do though it’s quite consistent, a few hours after getting your first 180 (scoring three triple 20s) you’ll be getting a hunger for throwing a perfect nine dart game. What does become apparent once you’ve found the right level of strength to throw the dart, is just how bloody hard you are throwing it. I found that holding it upside-down was best, releasing the trigger, as you have a much better on/off contact than with the Move button. Don’t forget that wrist strap and inform the casual players they don’t need to actually throw the controller at your TV, ruining Christmas. The game can be played with a DualShock pad, but it’s not a good idea. Rocking an analogue stick back then forwards for a throw is way too sensitive to play consistently. So yeah, just avoid the 360 version (no Kinect support). The Wii version holds up quite well though I hear. 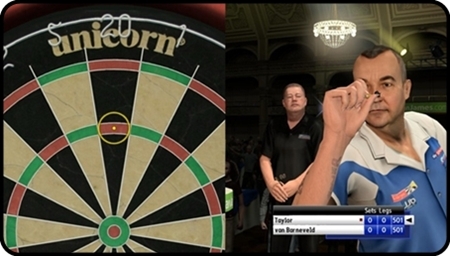 In the career mode you control an existing darts star or you can create your own. The presentation isn’t too shabby, although it’s a little dull and it would have been nice to see or hear a bit more enthusiasm from the crowd. You’ll need plenty of staying power if you’re going to become the World Champion as these matches are gruelling. In the first tournament, the first match didn’t take too long as my opponent failed to bring his glasses and didn’t win a single game. Later rounds were tougher though and they grew into best-of-19 matches. That’s right, 19 games in a row of painfully slow aiming and overweight safety dart/lovetoy throwing. Thankfully you can save your progress in-between opponents and come back later. Outside of the career mode you can play smaller exhibition matches at least. Standard games can be played with online or local multiplayer, but the most fun is to be found with the party games for two-four players. They include the likes of Around the Clock, Black ‘n’ White, Cricket, Fives, Half It, Killer, Knockout, Odd Man In and Shanghai. Don’t worry, you’re no less a man for having to google what the hell all that was about. You don’t have to be a regular fan of darts to enjoy the game and you could do far worse for a family Move title this Christmas. The Short Version: The long-winded matches in career mode make this a chore by yourself despite the action being fairly solid. Things perk up with multiplayer though and the game can be a good alternative to the PlayStation Move’s waves of kid’s party games and energetic sports titles.